Purdue guard Carsen Edwards (3) defends Michigan State guard Cassius Winston (5) during the second half of an NCAA college basketball game in West Lafayette, Ind. on Sunday. Purdue defeated Michigan State 73-63. TULSA, Okla. — Armoni Brooks scored 22 points, including six 3-pointers, and Houston became the first Division I men’s team to reach 20 wins this season. The Cougars (20-1, 7-1 American Athletic Conference) used a 49-24 rebounding edge to stay in control. Fabian White had 14 points for Houston, and reserve Nate Hinton finished with 13. for Houston. Chris Harris Jr. had 10 rebounds. DaQuan Jeffries led Tulsa (12-9, 2-7) with 17 points. Jeriah Horne had 15. PHILADELPHIA — Phil Booth hit seven 3-pointers and scored 25 points, helping Villanova to its eighth consecutive victory. The Wildcats (16-4, 7-0 Big East) made 17 3s and are rolling toward another conference crown under coach Jay Wright. The national champions still have some kinks to work out to become a deep threat in March — namely, finding a third scorer — but again should be a low single-digit seed in the NCAA Tournament. The Pirates (12-8, 3-5) remain 0-for-Nova on the road since 1994. The Wildcats have won 17 straight games on their home court against Seton Hall (15-0 Pavilion; 2-0 Wells Fargo Center) and were never threatened in this one. Myles Cale led Seton Hall with 14 points. The Pirates shot 35 percent from the floor. CHAPEL HILL, N.C. — Paris Kea and North Carolina gave coach Sylvia Hatchell the “wow moment” she asked for: an upset of top-ranked Notre Dame. 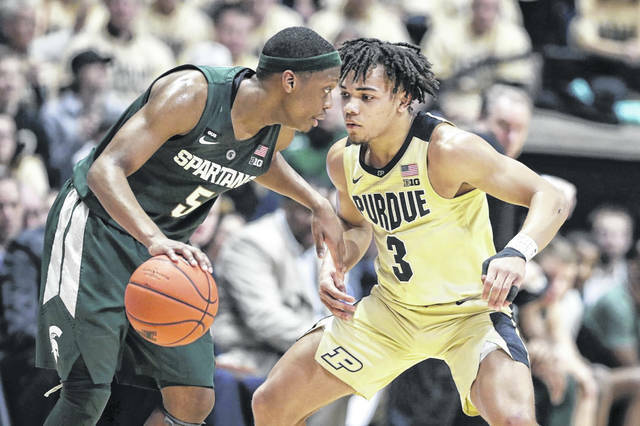 https://www.limaohio.com/wp-content/uploads/sites/54/2019/01/web1_MSU.jpgPurdue guard Carsen Edwards (3) defends Michigan State guard Cassius Winston (5) during the second half of an NCAA college basketball game in West Lafayette, Ind. on Sunday. Purdue defeated Michigan State 73-63.